Fixed deposits are the safest traditional form of investment in India. You must have been motivated by an elder to invest in FD schemes rather than taking risks with markets. The fixed deposits interest rate war is in full swing, with private lender ICICI Bank being the latest one to announce an attractive hike. Interestingly, ICICI Bank's new hike is not applicable on all tenures, but some specific long-term deposit ones. Once again, it would be senior citizens, who reap the most benefit compared to the general category. Fixed deposits are the safest traditional form of investment in India. You must have been motivated by an elder to invest in FD schemes rather than taking risks with markets. Today, ICICI Bank increased its fixed deposit interest rates by 25 basis points on less than Rs 1 crore with immediate effect. 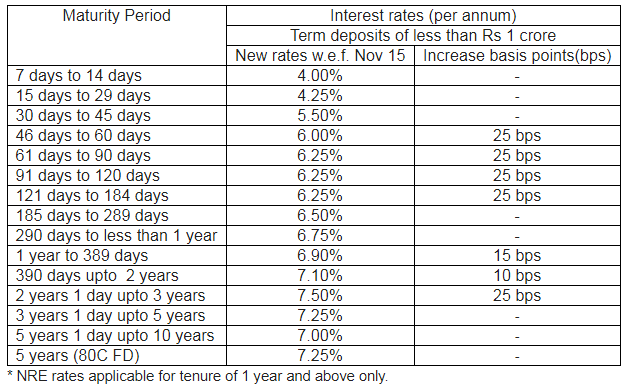 The new rates are applicable across various tenors for domestic term-deposits. It is also applicable for Non Resident Ordinary (NRO) & Non Resident External (NRE) term-deposits. 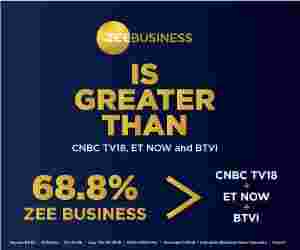 Pranav Mishra, Senior General Manager & Head – Retail Liabilities Group, said, “With the prevailing volatility in financial market, we see renewed interest by customers to invest in fixed deposits which offer a combination of attractive interest rates, liquidity and assured returns." With this hike, ICICI offers a peak interest rate of 7.50% on term-deposits with a maturity of above 2 years upto 3 years. ICICI Bank offers term-deposits with various maturities starting as low as 7 days and up to 10 years. It also offers a 50 basis points higher interest rate to senior citizens across term-deposits of all maturities. The bank in its notification said, "Customers can open a term-deposit at any of the Bank’s branches. In addition, they can conveniently open a deposit from the comfort of their home/office or on-the-go, using the Bank’s internet and mobile banking platforms as well as from ATMs and phone banking. " 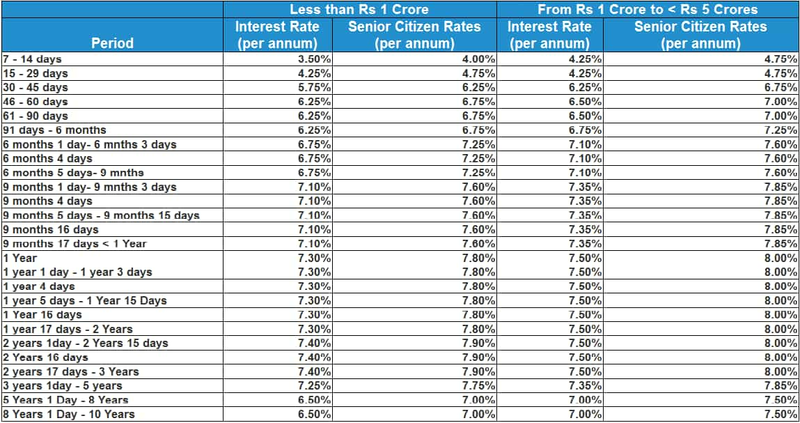 Interestingly, ICICI Bank is not alone to hike their FD rates, many lenders like HDFC Bank, ICICI Bank, Axis Bank and Bank of Baroda have on multiple occasions increased the fixed deposit interest rate to lure customers. What is surprising is that the largest lender SBI has still not made any hike in its fixed deposit interest rates. Most of the time, it would be SBI who makes the first move to hike FDs, and others have followed suit. Now that, major private lenders HDFC, ICICI and Axis Bank are increasing their rates on FDs to make it look much attractive, it will only be a matter of time when SBI follows the same dilemma. If we compare now the ICICI Bank and HDFC Bank who also announced a hike in FD rates this month only, SBI's FD interest rate are not that better. SBI offers 6.40% interest rate on FDs for normal category, whereas 6.90% to senior citizens for tenure between 211 days to 364 days on deposits below Rs 1 crore. As for between 1 year to less than 2 year, SBI gives 6.70% to normal category, while 7.20% to senior citizen. From 2 years to less than 3 years, 6.75% rate is offered and 7.25% to senior citizens. Meanwhile, for 3 years to less than 5 years, SBI gives 6.80% to normal ones and 7.30% to senior citizens. The highest interest rate is given for tenure between 5 years to 10 years, at 6.85% to normal category and 7.35% to senior citizens. Coming to largest private lender HDFC Bank, it gives 7.30% to normal and 7.80% to senior citizen for tenure of 1 years and till 2 years. The highest interest rate given by the bank would be 7.40% to normal ones and 7.90% for a tenure of 2 years to 3 years. 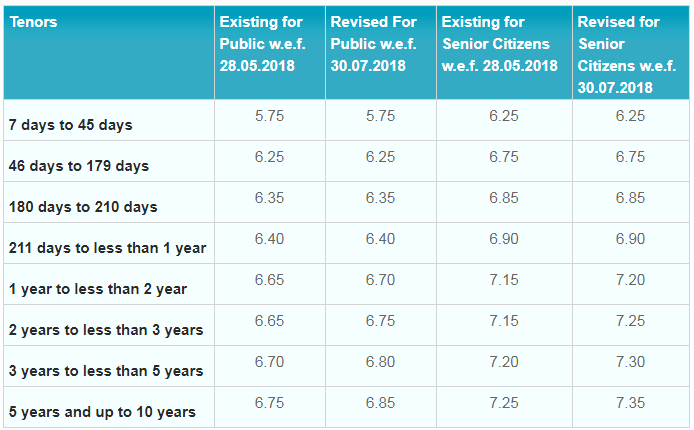 After the third year, the HDFC Bank's deposit rates have started to decline, as it stood at 7.25% (normal ones) and 7.75% (senior citizen) for 3 years to 5 years tenure, while was at 6.50% (normal ones) and 7% (senior citizen) for 5 years to 10 years tenure. Hence, all eyes will now watch when SBI will nudge and provide a some hike in their FD rates. The last time SBI made a hike in FDs was in the end of July month this year.